It is not caching for some reason. I tried disabling all plugins, there are not any conflicts. I go to clear the cache and it is always zero files. Was it caching until recently? What changed? Is it not creating any cache at all, or just very little? I wonder if something is preventing it from writing to the server. Is there space in the server? Are there any errors in your log? 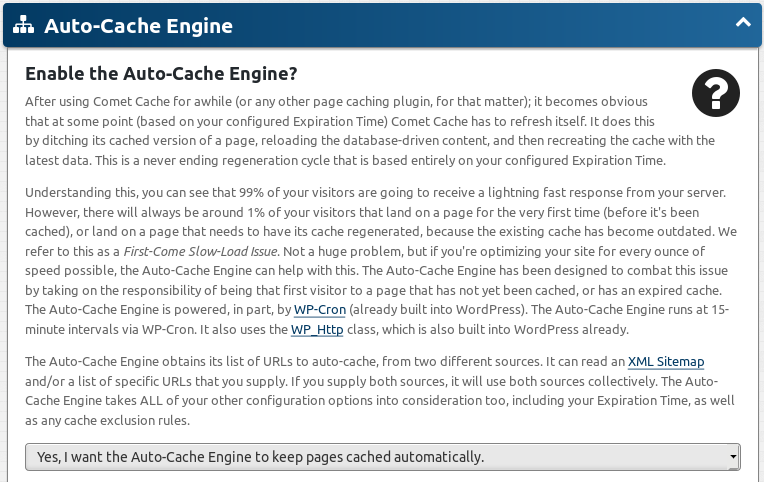 Are you using Auto Cache, or you're just letting cache pages get created as they get requested by visitors? It is not creating any cache at all. Can I have a look at your site? You can send me the info privately: click on my name and then the "Message" button. I was able to review your site, and found the reason for your lack of caching. Comet Cache was active, and I could see its message at the bottom of the page's source code. When logged in, it wasn't caching, because you have logged-in caching disabled. And when logged out, instead of caching, it said s2Member prevented the page from being cached. This happens when there's dynamic content on the page, e.g. an s2Member shortcode is used there. You had added the s2Eot shortcode to the navigation, under WP Admin > Appearance > Widgets > Header 1 > Text: Membership Expiration. So nothing was cached ever because that shortcode was used on every page. I removed the brackets, so that the shortcode would not work, and tested loading the page in a separate window while logged out, and this time the page was cached. I left the shortcode disabled, as I explained above, so you get caching happening as you wanted. I suggest that you add that s2Eot to the navigation only for logged in users. You could use a PHP condition to check that, don't use s2If or you'll have the same issue. I think a PHP condition would be fine, though. And if that doesn't work, the just put it in their Account page, instead of the navigation. Thank you SO MUCH! Working great and amazing detective work. Appreciate it. That's great! I'm so glad I was able to help you sort it out and that it's working well for you now.